To continue to reach those who do not yet know Jesus, CBA depends on the financial support of those who partner with us. Please pray to God about your financial situation and consider helping us with a tax-deductible contribution today! 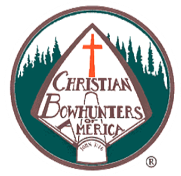 Support Christian Bowhunters of America just by shopping online! Go to www.smile.amazon.com and log in to your existing Amazon account (new users will need to create an Amazon account). Select your charity, which is Christian Bowhunters of America. Go shopping. That's it! You pay no more for your purchases and CBA receives up to 1% of your purchase total. As you consider giving to Christian Bowhunters of America it is important for you to know that we are a member in good standing with the Evangelical Council for Financial Accountability. ECFA membership provides an accountability structure to members in areas of governance, finances and stewardship, which gives greater confidence to givers. ECFA sets standards that insure the highest level of integrity. ECFA accredits Christ centered organizations with a “pass-fail” compliance of standards. These standards are set high, many of which are above federal or state law. The Standards are applied fairly by its Board of Directors and Standards Committee. When you give to Christian Bowhunters you have the confidence of the Evangelical Council for Financial Accountability supporting your decision. Christian Bowhunters of America is pleased to be able to report that we have always passed our annual review with ECFA.